Food Adventures of a Comfort Cook: Snowing once again, so time to make something new. Snowing once again, so time to make something new. Just as all the snow, from our last storm, was almost a memory, Monticello woke up to another batch of white covering the landscape, and our cars, and our lawns, and our...well, you get the picture. Snow here is unusual looking when compared to what I'm used to. It doesn't land as big fluffy flakes, but as tiny pellets, much like you would see in a stuffed toy. It's quite beautiful overall. Take two medium baked potatoes which have already cooled and cut them up into 1/2 inch cubes. In a 12 inch saute' pan (or skillet with curved sides), melt 2 Tbsp butter, add the potatoes and let them start to brown on high heat. Take one half of a small onion, dice it up and add to the potatoes with another 2 Tbsp of butter. Season with a dash each of salt, ground black pepper and garlic powder. Sprinkle a 1/2 cup of shredded Swiss cheese evenly. While the potatoes were browning, whisk together 6 eggs, 1/4 cup half n' half, 1/4 tsp salt, 2 dashes of hot sauce. Pour over the potatoes, making sure the eggs cover evenly to the edges of the pan. Now leave it alone for 5 minutes. 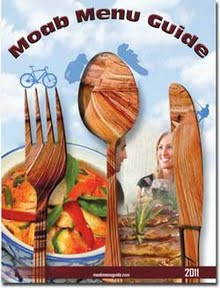 Cover with a plate and flip it over, so the contents of the pan simply drop onto the plate. Put the pan back onto the heat, slide the egg/potato "pie" back into the pan, and let cook another 3 minutes. Slide it back onto your plate and you have just made a frittata. Take a sharp knife and cut it into 8 wedges, just like you would to a pie. Next time you have extra ingredients around and think you can't do a thing with them; think again and make a frittata. Here's a little information on the frittata and another recipe. 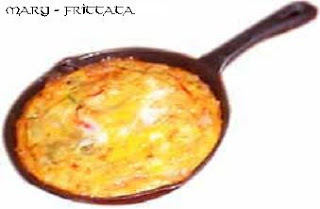 Frittata is an egg dish similar to an omelet or a crustless quiche, containing ingredients such as meats, cheeses, vegetables or pasta, and can be flavored with herbs. A frittata can be baked, but in mainly made in a skillet. When started on a stove top the frittata can be finished off in an oven, under a broiler, or flipped and finished in the pan. Frittata preparation differs from omelet preparation in that the eggs are beaten with water, milk or cream to incorporate more air where the eggs for omelets are less airy. The additional air in the frittata mixture allows for a deeper filling and a fluffier result. Additional ingredients are added to the pan after the egg mixture, and before the eggs are fully cooked. A frittata is usually divided into slices, and while it can be served as a meal by itself, a salad or other side dish can be added. In small bowl, whisk together eggs and half n’ half; set aside. In 10” skillet, on medium heat, melt butter and sauté asparagus, about 5 minutes; remove to another small bowl. In same skillet, pour in egg mixture and let eggs cook for about 5 minutes; do not stir. Distribute the asparagus, cheese, tarragon, salt and pepper evenly throughout the partially cooked eggs; let cook another 5 minutes. Slide the frittata onto a plate, cover with another plate and flip over; slide it back into the skillet and let cook another 3 minutes. Slide frittata onto clean serving platter, cut into wedges, either 4 or 6, to serve.